The premier must be a member of one of the two Houses of the Parliament of Western Australia; and by convention the premier is a member of the lower house, the Legislative Assembly. [a] He or she is appointed by the governor on the advice of the lower house, and must resign if he or she loses the support of the majority of that house. Consequently, the premier is almost always the leader of the political party or coalition of parties with the majority of seats in the lower house. The office of premier of Western Australia was first formed in 1890, after Western Australia was officially granted responsible government by Britain in 1889. The Constitution of Western Australia,  does not explicitly provide for a premier, and the office was not formally listed as one of the executive offices until the appointment of Ross McLarty in 1947. Nonetheless, John Forrest immediately adopted the title on taking office as first premier of Western Australia in 1890, and it has been used ever since. Minority government in first term in partnership with the National Party. Developed Perth's foreshore, began and completed construction of Elizabeth Quay, introduced plans for a new Perth Stadium, completed Gateway WA Road project, began Perth Freight Link and NorthLink WA Road projects, partially deregulated Perth's shopping hours, and sunk the railway line that divides Perth and Northbridge. Lost the state's AAA credit rating and presided over a 6.5% unemployment rate. Defeated at the 2017 election. As of 16 December 2018, seven former premiers are alive, the oldest being Peter Dowding (born 1943), who served from 1988 to 1990. The most recent premier to die was Ray O'Connor, on 25 February 2013, aged 86. 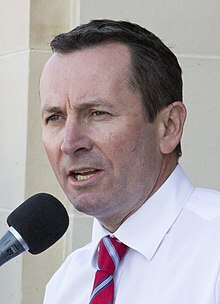 Wikimedia Commons has media related to Premiers of Western Australia . ↑ "Mark McGowan sworn in as WA's 30th Premier". ABC News. 17 March 2017. ↑ Constitution ACT 1889 (WA). ↑ Crowley, F. K. "Forrest, Sir John (1847–1918)". Australian Dictionary of Biography . Australian National University . Retrieved 30 January 2012. ↑ Garden, Donald S. "Throssell, George (1840–1910)". Australian Dictionary of Biography . Australian National University . Retrieved 30 January 2012. 1 2 De Garis, B. K. "Leake, George (1856–1902)". Australian Dictionary of Biography . Australian National University . Retrieved 30 January 2012. ↑ Bolton, G. C. "Morgans, Alfred Edward (1850–1933)". Australian Dictionary of Biography . Australian National University . Retrieved 30 January 2012. ↑ Hunt, Lyall. "James, Sir Walter Hartwell (1863–1943)". Australian Dictionary of Biography . Australian National University . Retrieved 30 January 2012. ↑ Gibbney, H. J. "Daglish, Henry (1866–1920)". Australian Dictionary of Biography . Australian National University . Retrieved 30 January 2012. ↑ Bolton, G. C. "Rason, Sir Cornthwaite Hector William James (1858–1927)". Australian Dictionary of Biography . Australian National University . Retrieved 30 January 2012. ↑ Adams, David. "Moore, Sir Newton James (1870–1936)". Australian Dictionary of Biography . Australian National University . Retrieved 30 January 2012. 1 2 Black, David. "Wilson, Frank (1859–1918)". Australian Dictionary of Biography . Australian National University . Retrieved 30 January 2012. ↑ Robertson, J. R. "Scaddan, John (1876–1934)". Australian Dictionary of Biography . Australian National University . Retrieved 30 January 2012. ↑ Cameron, Catherine. "Lefroy, Sir Henry Bruce (1853–1930)". Australian Dictionary of Biography . Australian National University . Retrieved 30 January 2012. ↑ De Garis, B. K. "Colebatch, Sir Harry Pateshall (Hal) (1872–1953)". Australian Dictionary of Biography . Australian National University . Retrieved 30 January 2012. 1 2 Bolton, G. C. "Mitchell, Sir James (1866–1951)". Australian Dictionary of Biography . Australian National University . Retrieved 30 January 2012. 1 2 Black, David. "Collier, Philip (1873–1948)". Australian Dictionary of Biography . Australian National University . Retrieved 30 January 2012. ↑ Doohan, Noelene. "Willcock, John Collings (1879–1956)". Australian Dictionary of Biography . Australian National University . Retrieved 30 January 2012. ↑ Layman, Lenore. "McLarty, Sir Duncan Ross (1891–1962)". Australian Dictionary of Biography . Australian National University . Retrieved 30 January 2012. ↑ Pendal, Phillip. "Hawke, Albert Redvers George (Bert) (1900–1986)". Australian Dictionary of Biography . Australian National University . Retrieved 30 January 2012. ↑ Black, David. "Brand, Sir David (1912–1979)". Australian Dictionary of Biography . Australian National University . Retrieved 30 January 2012. ↑ "WA loses its AAA credit rating as revenue declines and debt blows out". Australian Broadcasting Corporation. 20 September 2013. ↑ "Moody's downgrades WA credit rating as commodities prices plunge; fears of debt blowout". Australian Broadcasting Corporation. 8 February 2016. ↑ "WA Liberals wield double-edged sword as they target Labor's election promise costings". Australian Broadcasting Corporation. 4 March 2017.